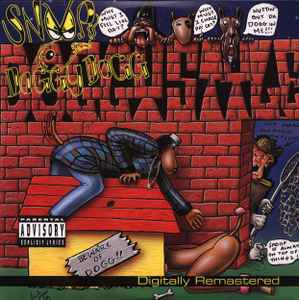 C8 –Snoop Doggy Dogg* Who Am I (What's My Name)? ℗© 1993. 2001 Death Row Recordings, LLC. Manufactured and Distributed by Death Row Recordings, LLC. Back cover states: "☮ to the streets"
The track listing on the vinyl labels uses continuous numbering (1 to 13). B6 is listed as "Murder Was The Case (DeathAfterVisualizingEternity)" on the back cover, while the label lists it as "Murder Was The Case (Death After Visualizing Eternity)". The featuring credit on D13 is listed as "Featuring Lil Malik, aka Lil Hershey Loc".